The Crossways Eco Arch house was designed by Richard, who is an architect, for his family residence. 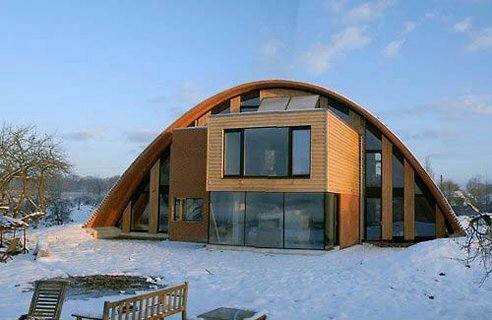 The house is constructed around a unique parabolic arch constructed from hand made clay tiles glued together. The foundations are a concrete slab made from 50% recycled content. Timber frame boxes provide the house structure under and protruding from the arch. The ground floor is a cross shape with a study, kitchen, sitting room and dining room branching off the hallway corridor. There are three bedrooms and a master bedroom suite on the first floor. The walls hare heavily insulated with recycled newspaper and clad in English cedar. Wool insulation is also used. The whole building is be enveloped in a metalized tough airtight membrane to prevent heat loss and is fitted with a ventilation system to recover heat from the air. This page was last modified 13:11, 7 July 2009.